The “Lakes Basin,” as it is commonly referred, sits in the morning shadows of Mammoth Mountain’s world famous ski slopes, and is located just a few miles to the southwest of Mono County’s largest town, Mammoth Lakes. The Lakes Basin offers dozens of angling opportunities from roadside options like float tubing for brookies at Twin Lakes, to shore casting for rainbows at Lake Mamie or Lake George, to trolling for rainbows at Lake Mary, to hiking required spots like McLeod Lake to fly fishing for Lahontan cutthroats or to search for legendary goldens as you make your way over Duck Pass (10,700’). 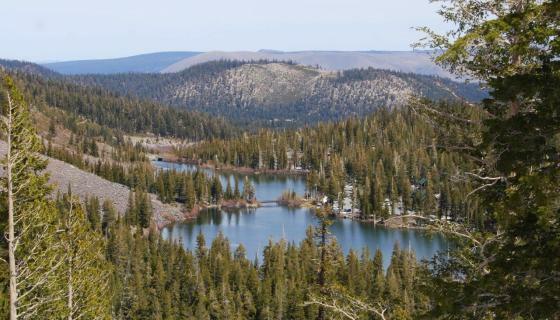 The Lakes Basin is an extremely popular spot for camping, as well as for bear sightings. It’s always a smart idea to book campsites for the crowded summer months in advance, and to have bear proof containers for food (no matter where you’re camping in the Sierra). It’s not uncommon to hear of a black bear stealing an unsuspecting angler’s stringer at spots like Lake Mary. Directions: From the town of Mammoth Lakes, take Main Street/Highway 203 to the junction of Minaret Road and Lake Mary Road. Continue straight through the intersection and drive 3 ½ miles to Lake Mary Loop Drive. 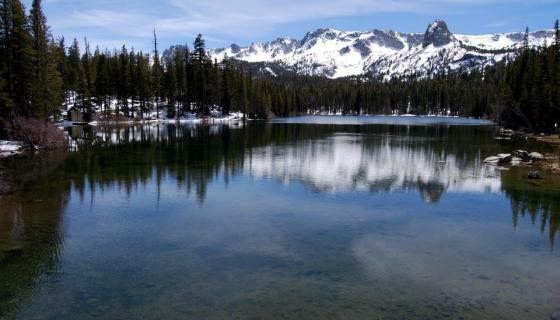 There are numerous campgrounds in the Mammoth Lakes Basin with ample spots for RVs and tents. Being so close to Mammoth Lakes, the basin is a very popular spot and reservations are highly recommend for weekends and holidays. 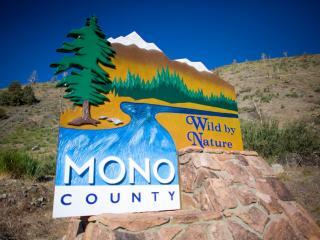 There are hotels and some public campgrounds in Mammoth Lakes as well. A paved bike path runs all the way from town through the Lakes Basin. Sites can be reserved online at recreation.gov or by calling 877-444-6777. 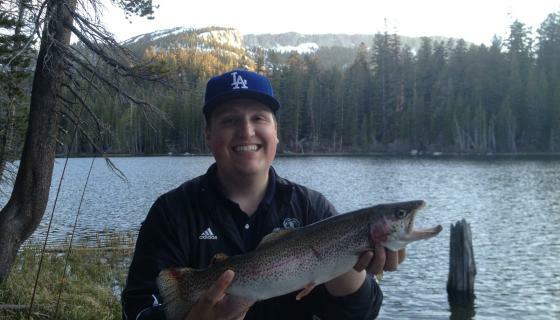 It’s awfully tough to top the Mammoth Lakes Basin for sheer variety of fishing options. Lake fishing fans will find everything from large drive-to lakes to small backcountry lakes well off the beaten path. And no matter whether you want to go trolling on Lake Mary, float tubing on Lake Mamie, canoeing on Lake George or hiking in search of brookies and golden trout in the High Sierra above the Lakes Basin, you will not be disappointed. For those who prefer to fish moving water, besides the numerous backcountry streams that lead to and from lakes, the San Joaquin River runs around the other side of Mammoth Mountain and offers a great, albeit small, freestone fishery. All of the lakes in the Mammoth Lakes Basin are above 8,000’ so be prepared to handle the higher altitude by drinking extra water and using plenty of sun protection.